In this dark musical about a mysterious strangler living for the limelight and killing for the headlines, who dresses appropriately for every murder, comedy has taken a sinister turn in the streets of New York City to create a genuinely funny show with a talented cast. A strangler is on the loose and detective Morris Brummell (Graham Mackay-Bruce) is the only person he seems to want to talk to. In a bizarre attempt to gain the fame he has always lusted over, serial killer Christopher Gill (Simon Loughton) becomes possessively attached to Morris and attempts to befriend him with regular, dependent phone calls. Desperate to live up to the expectations of his critical mother, a Broadway star, Christopher refuses to give up until the New York Times give him his name in lights, or a headline. Mackay-Bruce juggles the case with his overbearing mother (Judith Paris) with witty control, but he really comes into his own when his awkward personality proves to be an attractive feature in scenes with a new love interest, Sarah (Kelly Burke). All of Christopher’s victims are played by Paris, whose ability to slip seamlessly between characters enables her to shine, but there is not a weak member of the small cast. Douglas J Cohen’s lyrics are packed with humour and his book flows naturally to fill the theatre with laughter as the twisted tale of a boy hunting for fame becomes a chase for potentially the most helpful murderer to ever grace New York’s neighbourhoods. 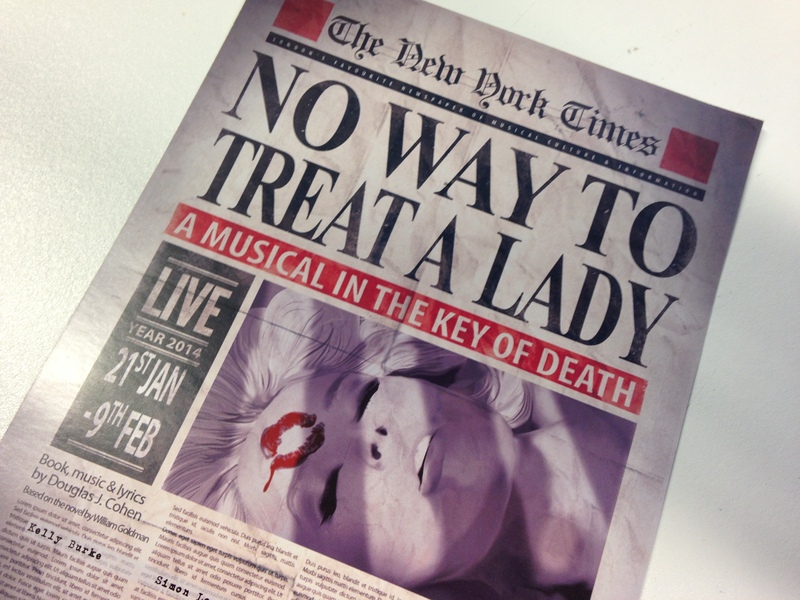 No Way to Treat a Lady is showing at the Landor Theatre until February 9.